Harumafuji a malencontreusement sorti son pied de la zone dans son combat contre Mitakeumi. 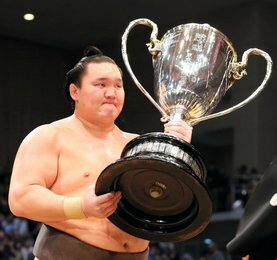 Hakuho a bénéficié mercredi de la première défaite de Harumafuji et prend la tête du classement en devenant le seul lutteur invaincu du tournoi. Après le retrait de Kakuryu la semaine dernière puis de Kisenosato aujourd’hui, il ne reste plus que deux yokozuna en compétition. Avec une défaite, Harumafuji (10-1) occupe seul la seconde place du classement suivi de près par Takayasu, Terunofuji, Ura et Tochinoshin au score de 9-2. Dans l’avant dernier combat de la journée, Hakuho a fait un pas de plus vers un 38e titre en s’imposant face à l’ôzeki kadoban Goeido (6-5) par uwatehineri . Hakuho a pris l’avantage sur son compatriote mongol quand le pied de Harumafuji a franchi par inadvertance les ballots de paille lors de sa rencontre avec le komususbi Mitakeumi. 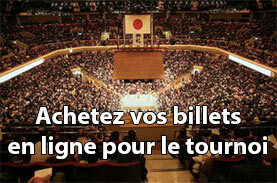 Visiblement encore fragilisé par sa blessure à l’épaule survenue en mars derniers, Kisenosato s’est retiré du tournoi. « Après avoir vu comment il a lutté hier contre Kotoshogiku, nous avons décidé qu’il devait déclarer forfait car il n’est pas en état de bien combattre« , a déclaré son maître Tagonoura oyakata. « Il était désespéré mais être yokozuna ne signifie pas qu’il doit lutter en toutes circonstances. Il va se soigner pour mieux se concentrer sur le prochain tournoi ». Takayasu n’est déjà plus qu’à une victoire de la promotion d’ôzeki après avoir vaincu Tochiozan (5-6). 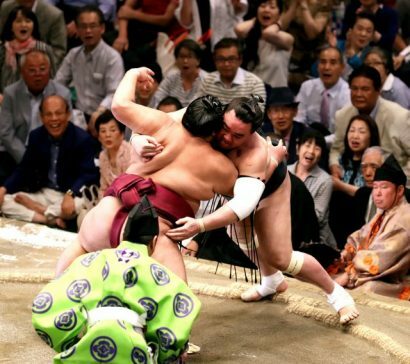 L’ôzeki Terunofuji s’est emparé du mawashi de Aoiyama (2-9), mais le mongol a pris son temps avant de projeter son adversaire à terre. Kotoshogiku a remporté une nouvelle victoire face à Chiyonokuni (2-9) pour améliorer son score à 4-7. Hakuho benefited from a slip-up by fellow Mongolian grand champion Harumafuji on Wednesday to seize sole possession of the Summer Grand Sumo Tournament lead with four days remaining. On a day when Kisenosato became the second grand champion after Kakuryu to make an injury-enforced exit from the 15-day tournament, 37-time Emperor’s Cup winner Hakuho improved his mark to 11-0 at Tokyo’s Ryogoku Kokugikan. Harumafuji is alone in second at 10-1, while promotion-chasing sekiwake Takayasu, ozeki Terunofuji, and the 10th-ranked maegashira pair of Ura and Tochinoshin are tied for third at 9-2. Hakuho was given a run for his money in the day’s penultimate bout, but once again came through with flying colors, scoring a clinical uwatehineri twisting overarm throw against ozeki Goeido to keep his spotless record. Fighting with his rank on the line for the fifth time in his career, Goeido dropped to 6-5 and needs to win at least two more bouts to avoid demotion to sekiwake for the July meet in Nagoya. Hakuho seized control when Harumafuji inadvertently stepped over the straw bales to hand komusubi Mitakeumi his fifth win. In a not entirely unexpected move earlier in the day, Kisenosato pulled out of the tournament with upper body injuries he initially sustained during the Spring meet in March. Kisenosato rushed his rehab in order to bid for a third consecutive championship title but it was clear from the opening day that he was still struggling with his fitness issues. As if to illustrate the point, the Tagonoura star on Tuesday was easily bumped out of the ring by struggling sekiwake Kotoshogiku, who had previously only won two bouts. « After seeing how he wrestled yesterday we decided he should pull out as he is in no condition for decent sumo, » said Kisensato’s stablemaster Tagonoura. 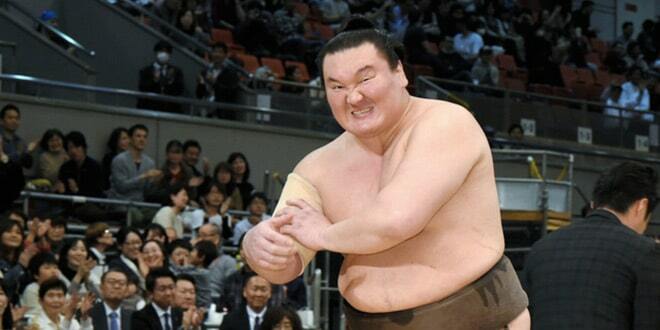 Back on the raised ring, Takayasu put fourth-ranked maegashira Tochiozan (5-6) on his knees to move within one win of the 10 he needs here — or 33 over three straight tournaments — to be considered for promotion to sumo’s second-highest rank of ozeki. Mongolian ozeki Terunofuji had his hands full with Aoiyama (2-9) but bided his time and came through with an overarm throw to put the Bulgarian No. 3 maegashira on the dirt. Kotoshogiku survived another day, tipping top-ranked maegashira Chiyonokuni (2-9) over the edge of ring to improve to 4-7. 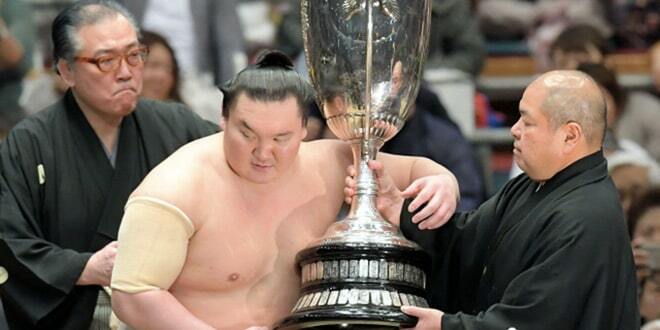 Kotoshogiku narrowly missed out on a swift return to ozeki at the last tournament, where he posted a 9-6 record.